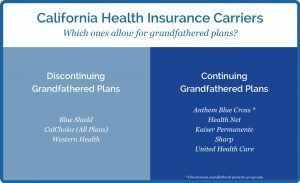 If you’ve been on the same health insurance plan since March 23, 2010 or prior, and there have been no major benefit or contribution changes, your plan is probably “grandfathered”. If your plan has grandfathered status, you may want to stay put. If you aren’t sure if your plan is grandfathered, you may want to contact your carrier to find out. Those who stay on grandfathered plans may have the most affordable rates. All the extra taxes and fees associated with Healthcare Reform don’t apply to grandfathered plans. Also, the grandfathered plans are less regulated. Health insurance carriers are required to accept people with serious pre-existing conditions on individual and family plans that are not grandfathered, so the rates on these plans are expected to be higher than grandfathered plans. All that to say, if you are on a grandfathered plan, may make the most sense for you to stay on your current health insurance plan. Check your options to make sure this is going to be the best option for your money. Those that qualify for a subsidy through Covered California may want to compare premiums and benefits to see if a grandfathered plan or a plan with a subsidy makes the most financial sense for their situation. Beware that some carriers have discontinued their grandfathered plans. If your health insurance carrier has discontinued offering grandfathered plans, you now have a plan that is compatible with the Healthcare Reform minimum essential benefits requirements. Premiums can be more expensive plan with better coverage. 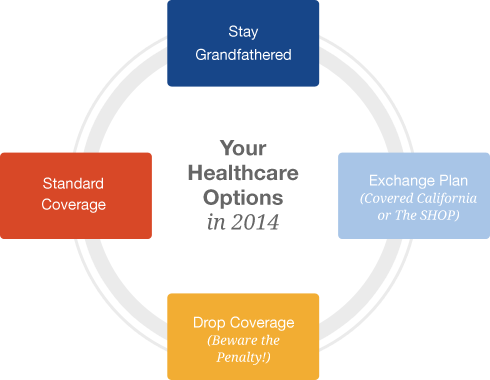 In 2014, if your health insurance plan was non-grandfathered, you were automatically switched to a plan that complies with the Affordable Care Act mandate when your policy renewed in 2014. Generally, you were switched to a plan that was most comparable to the one you were leaving. Expect better benefits at higher costs. Unless you are below 400% of the federal poverty level, individuals and families who have grandfathered plans will not want to switch. Rates on private health insurance rose dramatically in 2014 as tens of thousands of people with pre-existing health conditions entered the market. The only way people could shield themselves from these premium hikes was to stay on their grandfathered plan, switch to California group health insurance coverage or go uninsured. If your small business is on a grandfathered plan, it will probably be the most affordable option. However, due to the fact that Rate Adjustment Factors (RAF)* went away in 2014 (except on grandfathered plans), groups with high utilization may find it advantageous to switch to an individual or family, or small business plan through Covered California even though they are currently on a grandfathered plan. All the Covered California for Small Business Plans will be offered outside the exchange at the same rates. However, those enrolled in Covered California for Small Business within the state exchange will be able to offer multiple carriers to their employees while only getting one bill. Some small businesses who enroll through the exchange will qualify for government tax subsidies. There are some small businesses entertaining the more radical idea of dropping group coverage so employees can enroll on individual/family plans. For businesses of 49 or less full-time equivalent employees there is no mandate to offer health coverage and there is no penalty for not insuring your employees. Employees with household salaries less than 400% of the federal poverty level may qualify for tax subsidies from the federal government. Some of these employers may bump up wages a bit to make up for not offering healthcare. After crunching the numbers, employers may find that the business and the employees both save money by dropping group coverage and having their employees get individual coverage. Note: Be sure to double check with your insurance carrier or insurance agent to see if the plan you are currently enrolled under is in grandfathered status. * Rate Adjustment Factors (RAF): An RAF is a modifier that insurers apply against group health insurance policies at renewal. It is based on the frequency and severity of the medical services received by the group members in the last year. It is also known as “experience rating”. If your employees and their covered dependents over-utilized the medical plan, the RAF will increase the premium. Conversely, if your group rarely used your benefits, the RAF would lower the premium. Groups with low RAF’s will find it more advantageous to stay on their grandfathered plans.